Here’s a tasty and classy recipe that we served to our guest in Bethany tonight. The prep time is minimal. You can make the marinade ahead, add the steak tips, seal in a zip lock bag and freeze until ready to use (skip to step 2). We recommend buying steak tips when they are on sale. All of us love comfort food, and this is the perfect recipe for a busy family. The marinade is also our new favorite for steaks and grilling as we head towards summer – a teriyaki kind of flavor. We got rave reviews from our guest, so give it a try! In a shallow bowl, make the marinade by combining soy sauce, brown sugar, lemon juice, olive oil, garlic, onion, ginger and pepper. Coat beef tips with marinade. Cover and refrigerate for at least 6 hrs. Remove steak tips from marinade and pat meat dry. Reserve marinade. Heat a large skillet over medium-high heat with oil. When oil is hot and begins to smoke, add the beef and brown 3 min. on each side. Do not overcook. Remove when evenly deep brown and reserve on a plate. Add remaining 3 Tbsp. olive oil to skillet, heat until oil ripples then add mushrooms and brown 7-8 min. Add garlic after 5 to 6 min. Season mushrooms with salt and pepper and cook a few minutes more. Add sherry, reduce 1 minute. Add 1 cup of reserved marinade (strained). Reduce heat and cook, reducing liquid until thickened. Add beef tips, their juices and mushrooms to the pan, cook for 2 min. Serve with mashed potatoes and mixed vegetables on the side. This week’s recipe was inspired by an Asian guest that we were hosting for lunch at our guest house. As a novice learning to cook, I was always taught by the Sisters to really think about the person that I was cooking for: What would they like to eat? What would bless them? Subtle subtext here: it’s not about what I like to cook, or what blesses ME! So a gluten-free, colorful Thai soup came to mind — a recipe that I squirreled away awhile ago in hopes that some time I would have the opportunity to make it. I made a few adaptions which resulted in the recipe below. As I was chopping, I noticed that all of the ingredients were vibrant shades of green, so I dubbed them the liturgical ingredients of ‘ordinary time’. We rounded this lunch off with a delicate spinach and spring mix salad topped with avocado, fresh strawberries and candied almonds, and pita crisps. The dessert was a homemade Mango and Vanilla Panna Cotta — a recipe that I hope to share in future weeks! Heat the oil in a medium soup pot over medium-low heat. Add the shallots and ginger and cook, stirring frequently, until softened, 3 to 5 minutes. Add the green curry paste and cook, stirring constantly, for 1 minute more. Add the chicken broth, coconut milk, fish sauce, brown sugar, lime juice, and turmeric; bring to a gentle simmer. Continue simmering, uncovered, for 5 minutes. Meanwhile, cook the rice noodles according to the package instructions. If not using immediately, let them sit in a bowl of cold water. When ready to serve, taste the soup and adjust the seasoning. Gently reheat the noodles in the microwave, if necessary (remove from water first!). Place baby spinach in the bottom of the serving bowl, place the rice noodles and shredded chicken on top and ladle the hot broth over top and sprinkle with cilantro and scallions. Serve with a lime wedge for garnish. 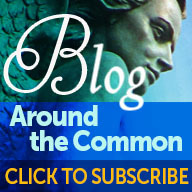 Today’s post begins a series of offerings from Guest Bloggers at the Monastery Kitchen! We hope you will be doubly blessed (as today’s author was!) by this beautiful story and recipe for a delicious Christmas breakfast. A new friend and a great recipe: I got a Christmas miracle two-fer! It was two days before Christmas and I simply did not have time. I couldn’t afford a run to the grocery store and deal with the bustling crowds of last minute shoppers in the midst of all that I was doing. But I’d forgotten the butter, so I was forced to brave the cold and the crowds. Making my way through the produce aisle, I spotted an elderly woman who was pushing her carriage slowly and seemed a bit lost. She sounded as if she were talking to herself. As I approached her, I discovered she was. I asked if she needed help. Fumbling through her purse, she pulled out a folded piece of paper and said she was looking for fresh blueberries for a recipe she found in a magazine. I went with the woman – whose name, I learned, was Ellen — to find the tucked-away fruit. We found them, but since the fresh blueberries were not in season and were a bit expensive, Ellen decided to opt for frozen. I began to walk with Ellen to the frozen food department on the other side of the store. We chatted along the way, and my new friend told me all about the recipe and how it is assembled in one pan on Christmas Eve to enjoy on Christmas morning. She sold me on the idea, so I grabbed a bag of frozen blueberries for my own shopping cart. Ellen and I gathered up the remaining items we both would need for the special Christmas breakfast. Before parting company, we exchanged phone numbers with the intention to chat again. After Christmas, we spoke on the phone and compared notes about our overnight Christmas French toast and we made a date to get together. That was several years ago. Since then, we’ve gone out for tea, watched a Christian movie at the theater, and chatted about our faith and families time and time again. I even brought Ellen a rosary from one of my visits to Rome. Though she is not Catholic, she said she appreciated it very much and began praying the rosary. Later on, she would tell me that she wasn’t sure if she was saying it just right, but that praying it brought her much comfort. We are still friends to this day. And to think that our friendship was born in a grocery store on a blustery day when I was tempted to not leave the house! But, oh, how I marvel over God’s mysterious and wondrous ways. He arranges beautiful serendipitous encounters that can turn into meaningful faith-filled meetings and even long-term friendships. We just need to open our eyes and our hearts—and slow down a bit too. Donna-Marie Cooper O’Boyle is an award-winning author and the EWTN television host of Everyday Blessings for Catholic Moms. A Catholic wife and mother of five, she was noted as one of the Top Ten Most Fascinating Catholics in 2009 by Faith & Family Live and enjoyed a decade-long friendship with Blessed Mother Teresa of Calcutta. To read more about Donna-Marie Cooper O’Boyle, or to purchase her wonderful book “Feeding Your Family’s Soul”, follow this link! Coat a 9 x 13–inch baking pan with nonstick spray, and arrange baguette slices in a single layer in the dish. I usually “cheat” and make more than one layer. In a large bowl, whisk together eggs, milk, three-fourths of the brown sugar (or honey), vanilla, and nutmeg. Pour the mixture evenly over the bread. Cover and chill the mixture overnight. There will appear to be a lot of moisture when the mixture goes into the refrigerator, but most of it will all soak into the bread throughout the night. 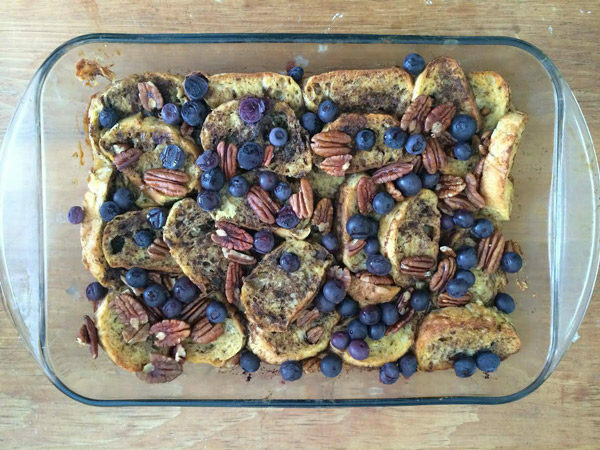 Just before baking, sprinkle the remaining quarter cup of brown sugar (or honey), the pecans, and the blueberries over the top. Bake in a 350ºF oven for about 45–60 minutes or until golden and bubbling. (Check it at 45 minutes and keep an eye on it for the remainder of the time.) It should be a light golden brown on top, and the egg mixture should be completely cooked. Serve with pure maple syrup. For an added treat, heat the syrup with extra blueberries to make blueberry-flavored syrup. You can serve this dish with fresh fruit on the side and breakfast sausage or bacon, too. Enjoy! I’ve heard it said that the sense of smell is the earliest and strongest to develop in humans. I remember once at a restaurant there was a special on oysters that came from the town where I grew up. I splurged and ordered them just for fun. When they arrived and the fresh, salty smell wafted up to me, tears came to my eyes along with so many wonderful memories of my childhood there on the water. I think it’s the same for many of us at Christmas. There are certain scents that transport you directly into this season of celebration and joy. Take ginger for instance! I love baking days here at the Community — as you cross the common, in addition to the beautiful lights and wreaths and garland, the smells drifting from the kitchen put smiles on everyone’s faces. It actually seems like another way to spread the good news: Christmas is coming! Jesus is on his way, and we’re getting ready — with Ginger Cake! Start with your ingredients at room temperature. Preheat the oven to 350°F and grease a 9" springform pan​ or ​a cake pan that's at least 2½ inches deep. In a small mixing bowl, combine the melted butter and brown sugar; mix well and pour the mixture into the prepared pan. Tilt the pan a little from side to side to help the mixture spread all the way to the edge. Arrange the sliced pears side-by-side over this brown sugar mixture, making sure that they cover the entire bottom of the pan. Set aside. In a large mixing bowl, combine the dry ingredients and mix well with a whisk until airy and fully combined. Set aside. In the bowl of your stand mixer equipped with the paddle attachment, beat the the butter and brown sugar on medium-high speed until light and fluffy, about 3 minutes. Add the eggs and beat again until pale and airy. Incorporate the apple sauce and molasses, mix until well combined, and then add the dry ingredients and mix on low speed until just incorporated, no more. Pour over the pears and spread all the way to the edge. Place a piece of aluminium foil under or around your pan to catch any eventual leakage and bake for 60 minutes or until a toothpick inserted in the center comes out clean. Let the cake cool for 10 to 15 minutes or until it's cool enough to be handled safely then flip it onto a rimmed cake plate. Serve warm, garnished with vanilla ice cream, chopped nuts and a drizzle of honey or caramel sauce, if desired. This week at Villa Via Sacra (Mount Tabor Centre for Art and Spirituality), we’ve been hosting Gabriel V Brass Ensemble as they participate in a-two week musical exchange with the world renowned Gomalan Brass Quintet. It’s always a great privilege and joy to “be in the background” serving these groups as they work hard to perfect their art, learning and discussing the music and seeking to bring it alive through both their personal and corporate vision. Music is a wonderful communicator — even though these groups speak two totally different languages, communicating has not been a problem at all. If you are in Tuscany, following the week of study with Gomalan Gabriel V will present a free concert at the Duomo di San Cristoforo in Barga, Italy on Oct. 6 at 21,00. We hope to see you there! Benedictine hospitality is at the heart of our mission, and we enjoy “spoiling” the artists with great food as they work tirelessly at their art day after day. Pears are in abundance now in Italy, so I made this wonderful cake for lunch yesterday. It’s quick and easy to throw together, and the moistness of the pears doubled with the homemade caramel just begs to be eaten with a big dollop of whipped cream sprinkled with nutmeg. Preheat the oven to 350 degrees. Lightly butter the sides of a 9-inch round pan with removable sides (like a cheesecake pan). Combine the butter, sugar, cinnamon, and nutmeg in a small saucepan and heat to boiling, then remove from heat. Scrape the mixture into the prepared pan and spread evenly. Arrange the pears over the butter mixture and press down. Beat the butter and sugar with an electric mixer until creamy, about 1 minute. Add the eggs and vanilla and beat until very smooth and fluffy, about 2 minutes. Sprinkle in the flour, cornmeal, baking powder, and salt, and beat 10 seconds. Pour in the milk and beat just until the batter is evenly moistened, about 1 minute. Pour the batter over the pears, then carefully lift the pan and bang back down on the counter once or twice to release any air bubbles. Bake approximately 45 minutes, or until a knife comes out clean. Run a knife along the outer edge of the cake to loosen it from the pan. Place a plate over the cake, then flip it over to invert the cake onto the pan. Let the cake cool completely before serving. Serve with a dollop of fresh whipped cream sprinkled with nutmeg. Thank you to "Living Well Spending Less" for this wonderful recipe!